Small onion plants for planting are referred to as sets. DIXONDALE FARMS is a good source for onion sets. The most popular is the 1015Y Texas Super sweet yellow onion. I also plant Texas Early White and Red Creole for stews and Cajun dishes. Plant around first week in October 4-8” apart. Put 1 tsp of soft phosphate or bone meal under the bulb before planting. Use a balanced organic fertilizer. Initially fertilize with high nitrogen fertilizer weekly until days are 12 hours long. Water often and keep bed weeded. Harvest April to June. Harvest all when leaves yellow and fall over. Store in a paper bag in the fridge. Onions should last 5 months. 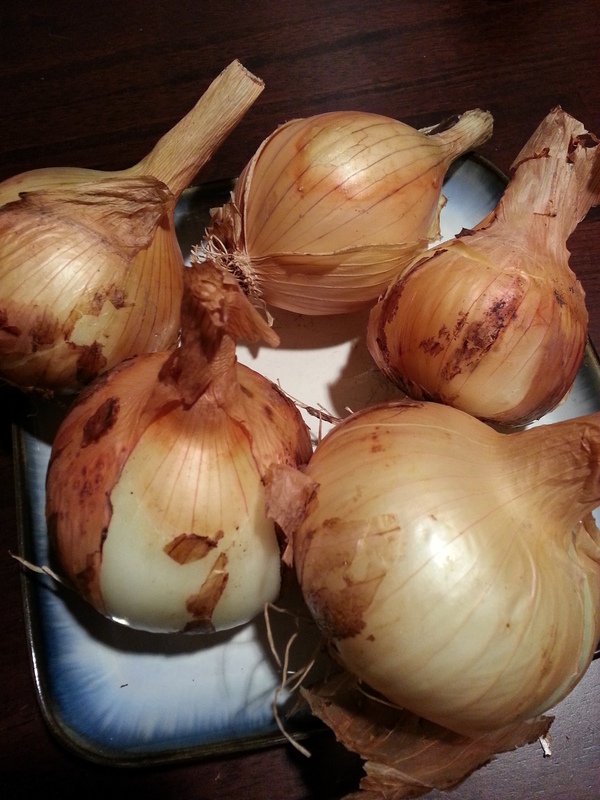 Here’s a few of the HUNDREDS of onion’s that were harvested! The BAUUC Community garden workday started under a threat of rain again as it has so often this spring. Nine hardy gardeners attended and took care of their beds and contributed labor and support for the garden. Foot long beans were planted in the 4 x10’ tented bed. We appreciate the donation of 1015 onions from Bruce. Emily did a wonderful job tying up the blackberry vines that were straying out into the walkways and attacking people. This should be a good crop and we look forward to the possibility of some cobbler on a Sunday morning! In addition to the blackberries, blueberries are ripening, beans have jumped up, and several types of tomatoes are just starting to turn red and the zucchinis are monstrous. George’s production beds should be supplying tomatoes, cucumbers, and eventually watermelons. We will need help to pick these and get them to food banks. Below are some shots of what’s currently growing in our wonderful gardens! On a sour note, our hope of growing soybeans failed miserably. Our dream of edamame and turning under the plants as “green manure” and visions of grass not taking over the beds in the summer did not work out. Well, back to the drawing board! Next time you are at the church take a walk through the garden. You can’t miss our new hurricane-proof (we hope) power pole. Thanks, CenterPoint, for not putting it in that bed! We are expecting some sunflowers, poppies and marigolds to be popping up soon and maybe even some poke salat! 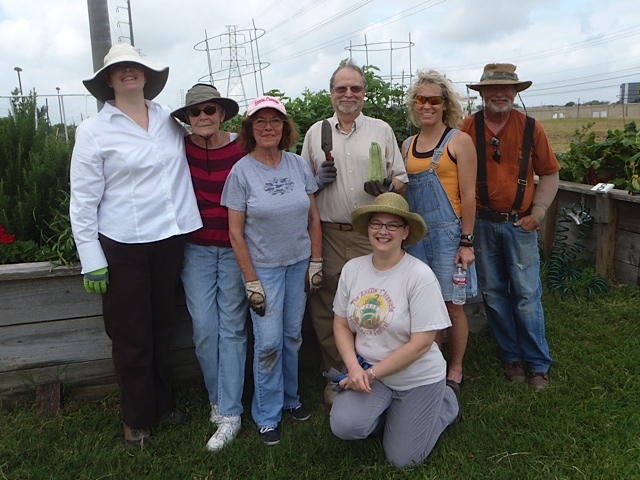 Below are some of our Volunteers and Gardeners! Beds are available. Volunteers are always welcome. Next work day is June 12th from 8-10:30 (our new summer hours). Come and join the fun! The BAUUC Community Garden serves the Clear Lake City suburb of Houston, Texas. We are a proud member of Urban Harvest of Houston Texas. Urban Harvest encourages community, good nutrition and sustainability through the teaching and support of organic gardening. Spring 2019 – Garden Kick-off!